Kanchipuram Idly is a special recipe of Kanchipuram , which is a holy city in Tamilnadu. This mildly spiced rice cakes tastes delicious with rich aroma. 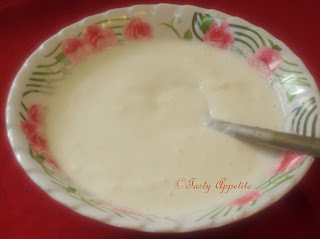 Its very good for health and makes a filling breakfast or dinner. In this recipe, the idly batter is prepared with idly rice, urad dal and tempered with spices. This recipe is a big hit in my family and it tastes excellent with coconut chutney and sambar. Wash and soak raw rice, idly rice and urad dal together in water for 5 to 6 hrs or overnight. Drain out water and grind it in grinder to coarse batter. Add salt and keep it aside to ferment for atleast 7 to 8 hrs. Once the batter is fermented, stir well. Temper with mustard, cumin, curry leaves, red chilly, grated ginger, freshly crushed pepper, grated cashew, split urad dal, hing and chana dal. Add the seasonings to the batter and combine. Grease the idly plates with sesame oil and pour batter. Steam cook for 12 to 15 mins. 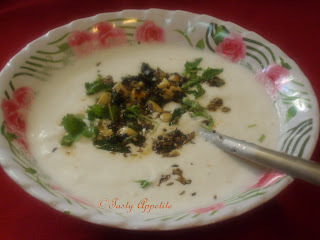 Serve hot with coconut chutney . Healthy and lipsmacking Kanchipuram Idly is ready to taste now..! I made this today but in a differnt method. This looks very tasty. எனக்கு மிகவும் பிடித்த டிபன் வகைகளில் ஒன்று,அருமையாக இருக்கு!! 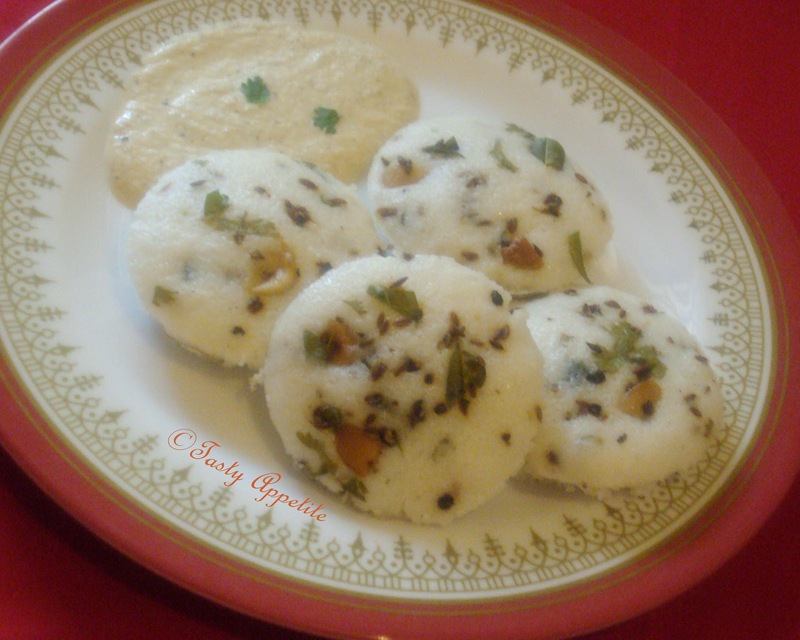 Idlis look very delicious Jay.......will have to try soon as I love idlis. Yumm and super spongy Kanchipuram Idli Dear.Classic. I didn't know these were originally from Kanchipuram.. Interesting to know.. Love these type of idlis though. I can eat idlis in breakfast, lunch as well as in Dinner. That's how much I loved it and I make a lot. Its gluten free. idly looks very soft n yummy! I feel like grabing those out of the screen !! 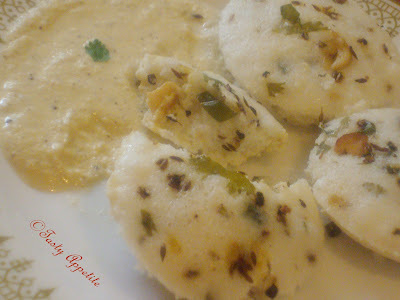 i love spicy and flavored idlis.. its a nice change fromthe usual same taste! I just had this at my company Deepavali celebration, but yours defenitely looks more yummy. Love this finger licking idlis with chutney. Fantastic one. Love idly..especially with sambar! Yours look great & you have me craving some now! so soft n yummy one of my fav ..
Looks very soft and delicious! Idlis look very delicious ! Idlis look soft, fluffy and yummy! Tempting clicks. i heard of this many times.but never ate. can u tell what exactly idli rice is.. is it a normal rava made of rice o something else. 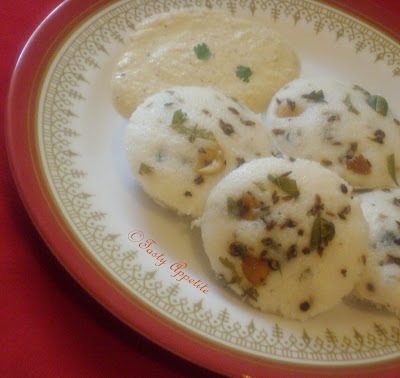 Love this idli simply with spicy coconut chutney..
would love to make this. Will give it a try if i can find idly rice, just about to google it, have never heard of this before. Thanks for sharing such a delicious looking recipe. Idli is one of my fav! Very interesting recipe!I have to try it!Kisses,dear Jay! I have not eaten idli in a while. This flavored one sounds delicious! This look wonderful. I love the flavors! Soft and spongy. Idlies are very perfect. Lovely. I love all the beautiful flavors in your amazing dishes Jay! Have an amazing day! This looks good! I made some idli several weeks ago. Have never tried with the spices before. KIV this! Thanks for sharing! Again something new to me specially with those spices, we have rice cakes but we never put spices on it. Beautiful display of food..Really looks delicious! Could have a plate of it right now , they look soft and delish :). Look so cute, really soft & yummy! Love this idli! great recipe ! Hey jay!!!! Been awhile i havent been able to catchup.... Seems like i have missed out alot!!!! Idlis!!! Watta a dish!!! Tempting and luring!! Kanchipuram idli is so moist n flavorful jay. Iam hungry now. This sounds and looks so tempting. Thanks for your precious time n valuable feedback.. I love these idlis but have never made them at home. I am going to try your recipe. It looks delicious! Wow! this sounds interesting! Like this kind of idlis very much... Thanks for being my follower jay :) am interested in diff. innovative veg. recipes more! Looking forward to it!